Taco Stuffed Avocados. The perfect low carb Taco! 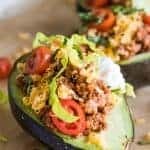 These avocados are loaded up with the BEST taco meat, cheese, tomatoes, lettuce and a dollop of sour cream. Perfect for an easy lunch or light dinner. Add the ground beef to a medium size sauce pan. Cook over medium heat until browned. Drain the grease and add the seasonings and the tomato sauce. Stir to combine. Cook for about 3-4 minutes. Remove the pit from the halved avocados. Load the crater left from the pit with the taco meat. Top with cheese, tomatoes, lettuce, cilantro and sour cream. If you want to make a larger area in the avocado for the toppings, spoon out some of the avocado and set aside to make guacamole! Then fill with toppings. Serve with some Cilantro Lime Cauliflower Rice!